Flag is an old-fashioned name for bearded iris. Their scientific name is Iris germanica and they are also known as Rhizomatous iris and German iris. Iris means "rainbow" because they flower in every color. Iris can be grown under a variety of conditions, from desert to swamp, and they naturalize quickly wherever they are planted. Iris bulbs are rhizomes, which are a swollen tuber that grows close to the surface of the soil. The plant regenerates each dormant season and multiplies by creating new clusters of rhizomes. One way to name the many types of bearded iris is by classifying them as tall, intermediate and dwarf. Tall bearded iris grows to 40 inches in height. Iris cultivated from the wild were originally shades of blue and purple. There are many varieties now that have tricolors of every hue, including striped petals. Iris flowers have center upright petals called the standards, an outer petal called falls and a fuzzy line on the falls called the beard. The Expose variety was introduced in 2004 and is a unique bearded iris with white standards, yellow striped falls and tangerine beard. The stripes are dark blue to an outer band of yellow. Although purple is a familiar iris color, Mount Vesuvius is a dramatic new shade of rosy purple. The beard is antique yellow and the petals are ruffled along the outer edge. Tall bearded iris thrives in a sunny location in average soil that is amended with compost after each blooming season. Intermediate iris grows to a height of 20 to 26 inches. They need water in their first growing season as they establish themselves but can then be thought of as drought tolerant. Water iris plants once in the spring. 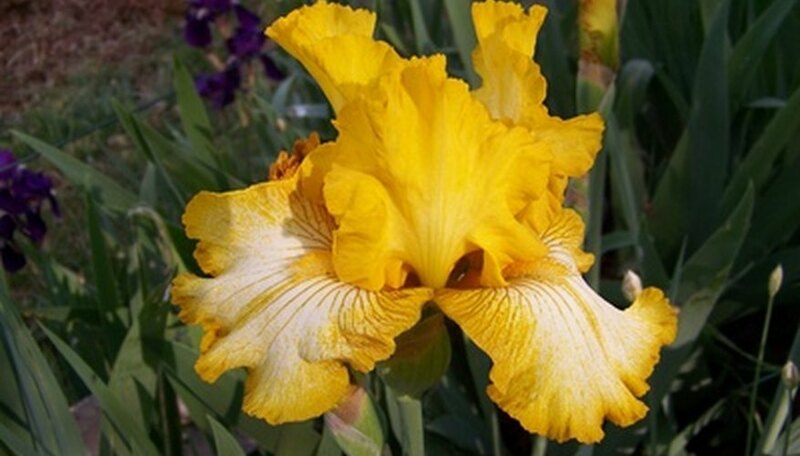 The intermediate iris named Brat grows to 26 inches in height and has antique gold yellow standards and beard with maroon falls. The petal edges are ruffled with a yellow band. Another dramatic iris color scheme is found on Blueberry Filly. It is red-violet with silver-white streaks on all the petals and the beard. Dwarf iris average 11 to 13 inches in height. They prefer bright morning sun and do well in average soil. The best planting time is fall or spring. Iris rhizomes of all types need to be thinned every three or four years by separating the tubers and replanting. 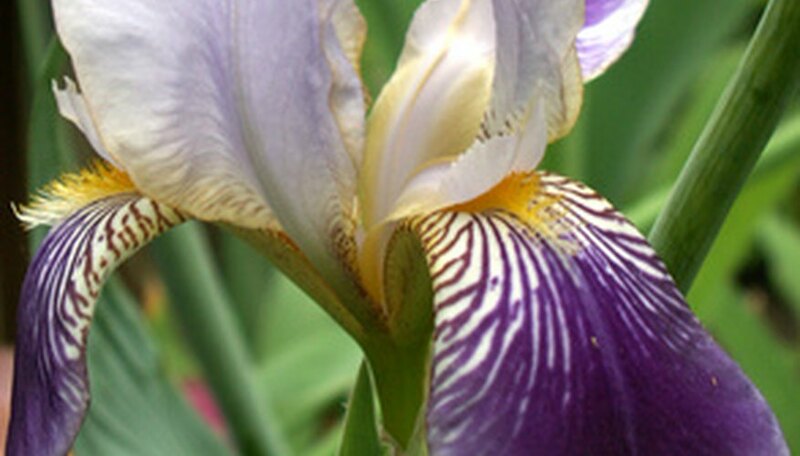 Each iris plant blooms for two weeks, with varieties that flower from early in the spring to late summer. Dwarf iris flowers are smaller but shaped the same as taller varieties. Autumn Jester is a standard dwarf bearded iris with blue petals striped in dark purple. Black Cherry Delight has a bicolor flower of white and purple. The standards are creamy white and the falls are dark purple to an outer border of white.